Supreme Court and the EPA’s effort to curb pollution in EPA v. EME Homer City Generation. That’s the question in a case that will be argued on Tuesday. 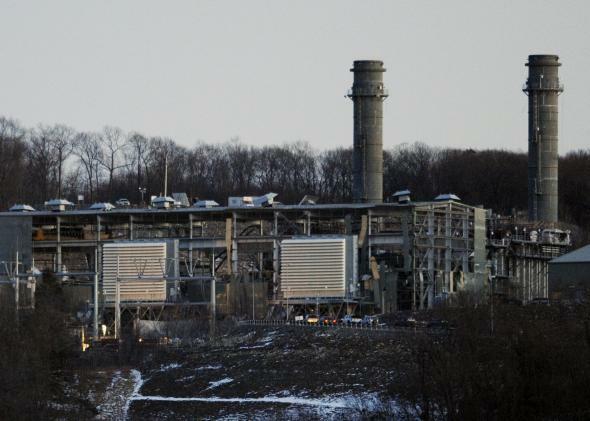 Even if Connecticut cut all its in-state emissions, like from this natural gas power plant in Middletown, Conn., to zero, pollution from other states would still keep Connecticut from meeting federal air quality standards. The Supreme Court will hear oral arguments Tuesday in a case about what the Environmental Protection Agency can do to keep states from spewing pollution into their neighbors’ air. EPA v. EME Homer City Generation arises from the “good neighbor” provision of the Clean Air Act. In that provision, Congress gave power to the EPA to reduce the emissions of states that “contribute significantly” to the inability of states downwind of them to meet the law’s standards for air quality. Connecticut, for example, has polluting neighbors: A congressional report found that even if Connecticut turned off every emissions source in the state, pollution from other states would make it fail the test set by federal ozone standards. The EPA’s “good neighbor” regulations, which went into effect in August of 2011, have two steps. First, the agency determines whether an upwind state is responsible for at least 1 percent of any downwind state’s allotted amount for a pollutant. Virtually every upwind state the EPA has studied falls into this category. Second, the EPA imposes on every one of these upwind states the same elaborate set of rules, with the goal of drastically reducing their total emissions. Fourteen upwind states—most prominently Texas—have challenged this process (which is called the Transport Rule). They claim that the EPA exceeded the power Congress delegated to it. They’re irked by the fact that all upwind states got the same federal regulations, whether they are a minor polluter or a major one. The states further object that the EPA imposed its rule without first giving each state the opportunity to develop its own regulations. In a 2–1 decision, a panel of judges on the U.S. Court of Appeals for the D.C. Circuit agreed with the states. They found that the Transport Rule exceeded the power Congress delegated to the EPA. They also said that in order to comply with the statute, the EPA can’t implement its regulations until it has shown exactly how much pollution each upwind state contributes to its neighbors, and given each state a chance to develop its own regulations. On the surface, this case is simply about interpreting statutory language. The D.C. Circuit reads the statute to empower the EPA to regulate only that portion of upwind state pollution that qualifies as a “significant contribution.” The EPA reads the statute as giving it the power to regulate the total emissions of any upwind state. The D.C. Circuit’s reading of the statute may be the more natural one. But in the past, the EPA’s interpretation would probably have been close enough to win in court. Since a major Supreme Court ruling in 1984 (about the Clean Air Act, as it happens), the general rule for courts has been that if Congress writes a law that gives power to an agency, and some of the statute’s language is ambiguous, judges defer to the agency’s interpretation of the statute. The idea is that the agency has all the expertise and experience. Take air quality measurements, for example. Contrary to the D.C. Circuit’s implicit assumption, determining exactly how much each state is contributing to other states’ pollution is borderline impossible. The pollution pattern for each state is a tangle of interconnected parts that change every day in unpredictable ways. Pinning down an exact contribution from each state is literally like chasing the wind. Also, from a cost-benefit standpoint, the EPA’s regulations make sense. The EPA is right to claim that the only way to effectively reduce pollution in downwind states is to reduce the collective emissions of all the upwind states. The agency also set its regulations at cost-effective levels that get the most pollution reduction for the money. The D.C. Circuit’s approach would make it harder and more expensive to reduce pollution. The general opinion is that the Supreme Court will overturn the D.C. Circuit and support the EPA. But even if the Supreme Court allows for tighter federal control of pollution this time, the war over agency discretion may just be starting.